Turkish Savory Rice Porridge Lapa is so easy to make with simple ingredients. You only need rice and water. Topped with yogurt and served savory as a healing dish, not at breakfast. Have you ever tried Turkish Rice Pilaf With Orzo? This rice porridge is like a lighter version of it. No orzo, no oil and much creamier. This rice porridge has become one of my son’s favorite dishes since I made it to help his nausea and diarrhea two years ago. Every Turkish mom makes it whenever their kids feel sick especially because of these two problems before consulting a doctor. Even doctors recommend it along with medicine. Why Is Rice Porridge Good For You? 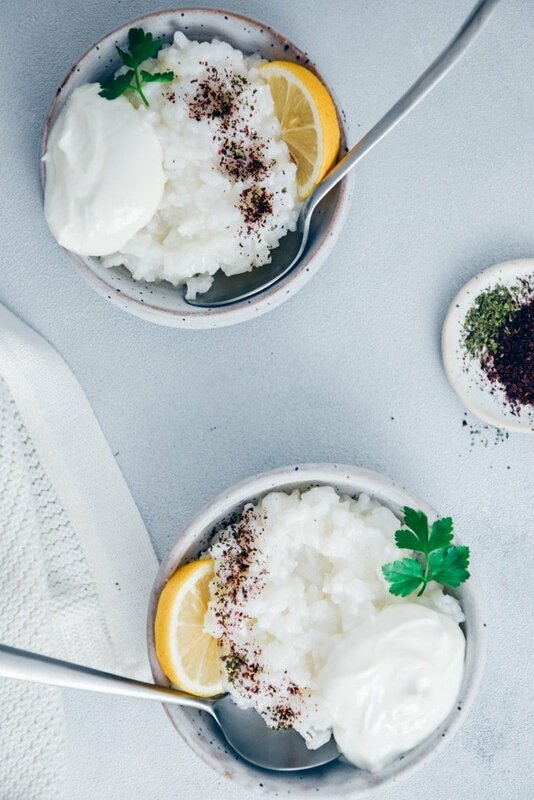 Secondly, Turkish rice porridge recipe calls for plain yogurt as a garnish, which is good for relief from nausea and diarrhea. As a result, rice porridge with yogurt makes a perfect combination for the health problems above. Furthermore, the spices in this recipe are good for stomach problems too. Sumac and dried mint help you feel better. On the other hand, if you are planning to make this porridge for relief from nausea and not very familiar with these spices, you might need to leave them out. The porridge will still help you recover. Finally, adding a few drops of lemon is optional but it gives a nice flavor and again it is a good way of stopping stomach troubles. How To Make Rice Porridge Turkish style? This rice porridge recipe has three parts. First, rinse it briefly. Don’t try to get rid of the starch completely. We need it for creaminess. Second, simmer the rice and water in a pot over the lowest heat until tender, stirring every now and then so that the rice won’t stick at the bottom of the pot. The ratio depends on how you like your porridge. I make it with 1 cup of rice and 6 cups of water. When the rice is tender enough, check the consistency. If it’s still too thin, simmer longer. If it’s thicker than you desire, add a little hot water and let it simmer for a few minutes. If you like your porridge really thin, start with 1:8 or even 1:9 ratio. It might look too thin at first, but it gets thicker and creamier as it simmers. Don’t forget that the rice porridge gets thicker as it sits because the rice keeps absorbing water. You can always add extra hot water when reheating the leftovers. The third part is about garnishing the porridge. Typical Turkish rice porridge has some plain yogurt on it, that’s it. Nothing else is needed. However, in some regions of the country, spices like sumac and dried mint or thyme are also added. These spices are known with their benefits to stomach problems, so it’s not just about flavoring the porridge. Oh and although it’s not common, I love mine with lemon, which always relieves me whenever I have an upset stomach. Don’t add the garnishing ingredients to the pot, make it for each bowl separately. Turkish porridge Lapa and Chinese porridge Congee are basically made with the same two ingredients: rice and water. Mostly with the same method; boiling rice in a pot of water until tender. While Turkish rice porridge calls for plain water, Chinese porridge can be made with chicken or beef stock though. On the other hand, these two porridge recipes are completely different when it comes to their garnish. Turkish lapa is topped with yogurt only, no oil is added whereas Chinese congee has several garnish options from chicken, meat or seafood to vegetables and a little oil is added in the boiling process. 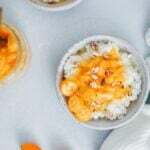 Another difference between these rice porridge recipes is about the serving. In Turkey, people eat lapa as a remedy for stomach problems. However, Chinese people serve congee as a meal with stir-fry dishes or sometimes as breakfast. If you don’t have any stomach problems and are looking for a sweet rice recipe, you have to try Turkish Baked Rice Pudding Recipe, my favorite dessert ever! If you end up with too much porridge, keep it in the refrigerator. Make sure you don’t add the garnish ingredients into the pot. You can even freeze the leftovers if you think that you won’t be able to finish it in a few days. 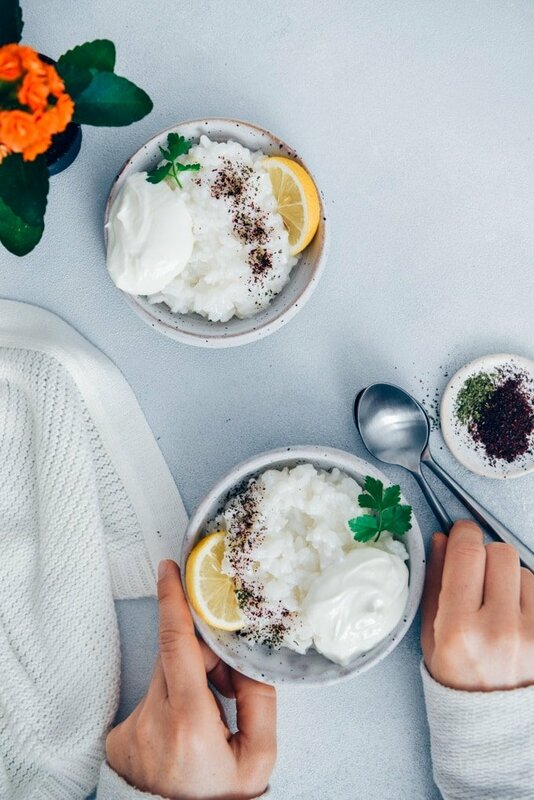 A super healthy and light rice porridge made with rice, water and yogurt. Helps to cure stomach problems and diarrhea. Rinse the rice briefly. Don’t over-rinse. We need the starch in it. Bring the water to boil, add in the rice, reduce the heat and cook until it boils. Bring the heat to the lowest and let it simmer for about 20-25 minutes. Stir it every now and then so that the rice doesn’t stick at the bottom of the pot. Check the consistency. Simmer longer if it’s thinner than you want, add more hot water if it’s thicker. Serve it in bowls with some plain yogurt, lemon wedges, sumac and dried mint. Store the leftover rice porridge in the refrigerator without the garnish.